Would you tip your dentist? Don't be surprised if you one day find yourself calculating a tip after a dentist appointment, a check-up at the doctor or a meeting with your accountant. Businesses outside of the food and hospitality industries are presenting customers the option of leaving a tip, according to mobile payment company Square. The company's Square Register allows businesses to accept credit cards, track inventory and receive orders online. It also has a "Smart Tipping" feature that can be turned on or off at merchants' discretion, an indication of whether they choose to accept tips. Grace Chen, Square Register product lead, said some health care professionals that use the technology, including doctors and dentists, are starting to incorporate the tipping feature along with others in the professional services -- like lawyers, accountants and business contractors. While tipping in these professions still lags behind the typical industries where gratuity is common, the demand is growing, she said. "We get a lot of requests of being able to add tips to invoices," said Chen. "Landscapers and contractors will use it, too." If a business is using the tipping feature, it can choose whether to present customers with percentage-based tip options or set dollar amounts. 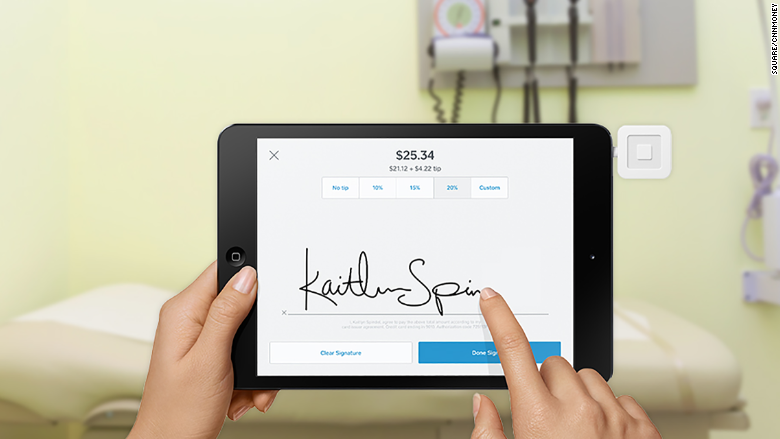 Business owners can also decide when the tip screen appears -- either before or on the same screen as the signature. "We have merchants who have strong preferences both ways," said Chen. "Some don't want the extra steps and others want to be more forward and force the person through that step. Either way, the merchant has the full ability." Customers can choose "No Tip" or "Custom" tip under both settings. Making it as easy as a tap to add a tip is paying off for businesses. According to the company, Square users saw a 35% increase in tip frequency in 2014 from 2013. The average tip is around 17%. "As far as tipping, we want to make it easy for whatever merchants want to do and what a customer wants to give," said Chen. "The kinds of people using it want tips and customers want to tip. We continue to add it wherever we see demand for it." Related: Could this mean the end of tipping? Tipping is standard in the food and hospitality sectors, with many workers depending on tips as part of their pay. According to Square, more than 70% of all restaurants, bars, salons and taxi companies that use Square offer the tipping screen. Square also offers two printed receipts options: either a standard format or the "Quick Tip Receipt." The traditional receipt option does include a tip line, and the Quick Tip Receipt has boxes with different percentage tips for customers to select and shows the total with the added tip.